Longyearbyen (Norwegian pronunciation: [ˈlɔŋjeːrbyːən] (literally The Longyear Town) is the largest settlement and the administrative centre of Svalbard, Norway. As of December 2015, the town had a population of 2,144. Longyearbyen is located in the Longyear Valley and on the shore of Adventfjorden, a bay of Isfjorden located on the west coast of Spitsbergen. Since 2002, Longyearbyen Community Council has had many of the same responsibilities of a municipality, including utilities, education, cultural facilities, fire brigade, roads and ports. The town is the seat of the Governor of Svalbard. It is the world's northernmost settlement of any kind with more than 1,000 permanent residents. In 1896, Vesteraalens Dampskibsselskab started tours to Hotellneset. To accommodate tourists, they built a prefabricated hotel, but it was not profitable and was closed after the 1897 season. However, two families overwintered in 1898–99 and Norway Post operated a post office at Hotellneset from 1897 to 1899. The first commercially viable coal on Svalbard was harvested by Søren Zakariassen in 1899. In 1901, Bergen-Spitsbergen Kullgrube-kompani started mining coal in Adventtoppen. The American industrialist John Munroe Longyear visited Spitsbergen as a tourist in 1901, where he met with an expedition prospecting for coal. He returned to Spitsbergen 1903, where he met Henrik B. Næss in Adventfjorden, who gave him samples and information on coal fields. Along with his associate Frederick Ayer, Longyear bought the Norwegian claims on the west side of Adventfjorden, and expanded the claims significantly the following year. In 1906, the Boston-based Arctic Coal Company, with Ayer and Longyear as the main shareholders, started mining in Mine 1a, after having built docks and housing. The company had American administration, but mostly Norwegian labourers, and named the town Longyear City. Coal was transported the 1.2 kilometers (0.75 mi) from the mine to the port using an aerial tramway built by the former world leading aerial cableway company Adolf Bleichert & Co. from Leipzig, Germany. In 1913, the company started preliminary work to open Mine 2a. Following financial difficulties during the First World War, the mining operations were bought by Store Norske, which was incorporated in Oslo on 30 November 1916. That year, SNSK built five new barracks, including one that was made into a hospital. SNSK introduced its own money with approval from Norges Bank, consisting entirely of banknotes at par with Norwegian krone. The American community buried their dead at Hotellneset. In 1918, eleven people were killed by the Spanish flu and a graveyard was established in Longyear City. Two years later, 26 men were killed in a coal dust explosion in Mine 1. This resulted in the mine being closed and electric operation being taken into use in Mine 2. The same year, the first truck was delivered for use in the mining operations. The Church of Norway appointed Thorleif Østenstad as Svalbard's first vicar and teacher in 1920. A school was established as a cooperation between the church and SNSK and had an inaugural eight pupils. The first Svalbard Church opened on 28 August 1921, and the church's reading room was from then used as a school. Longyear City was renamed Longyearbyen in 1926. The Norwegian Telecommunications Administration established a coast radio station, Svalbard Radio, at Finneset in 1911, which was moved to Longyearbyen in 1930. The town's tourist industry started in 1935, when SS Lyngen started calling regularly during the summer season. In 1937, SNSK established Sverdrupbyen to house workers for Mine 1b and operation of the mine started in 1939. In 1938, Longyearbyen's first road was completed, between the town center and Sverdrupbyen. Operations at Mine 2b, a different entrance to Mine 2a, started in 1939. Svalbard remained unaffected by the German occupation of Norway in 1940. However, from 1941 the archipelago became of strategic importance in the supply chain between the Allied powers, as well as a source of badly needed coal. The Norwegian government-in-exile rejected a Soviet–British occupation; instead the British Army started Operation Gauntlet to evacuate Spitsbergen. On 29 August 1941, the entire population of Ny-Ålesund was evacuated to Longyearbyen, and on 3 September 765 people were evacuated from Longyearbyen to Scotland. Later the last 150 men were also evacuated. 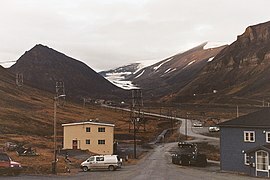 With Longyearbyen depopulated, a small German garrison and air strip was established in Adventdalen, mostly to provide meteorological data. After the British Operation Fritham regained control of Barentsburg, the German forces left Longyearbyen without combat. In September 1943, the Kriegsmarine dispatched two battleships, Tirpitz and Scharnhorst, and nine destroyers to bombard Longyearbyen, Barentsburg and Grumant. Only four buildings in Longyearbyen survived: the hospital, the power station, an office building and a residential building, in addition to Sverdrupbyen. Longyearbyen remained unsettled until the end of the war, with the first ship from the mainland leaving on 27 June 1945. Plans were laid during the war to ensure a quick reconstruction and commencing of mining. By 1948, coal production reached the pre-war level of 480,000 tonnes (470,000 long tons; 530,000 short tons) per year. Nybyen was established in 1946 and consisted of five barracks, each housing 72 people. The first issue of Svalbardposten was published in November 1948. Until then, there had irregularly been published various wall newspapers. In 1949, Longyearbyen received telephone service with the mainland via a radio connection between Svalbard Radio and Harstad. In 1949, a farm was built in Longyearbyen to hold cattle for milk, pigs and hens. A local radio station started broadcasting in 1950. The burial ground remained in use until 1950, seeing 44 people buried. However, it was discovered that the bodies were failing to decompose because of the permafrost. Bodies have since been sent to the mainland for burial. The community center Huset opened in 1951. Mining in Mine 1b was terminated in 1958, but operation in Mine 5 started the following year. Preliminary work on Mine 4 started in 1954, and from 1960 it was used as a reserve mine. The Norwegian Air Force started serving Longyearbyen with postal flights in the 1950s. In 1959, a man fell seriously ill, so a landing strip was prepared in Adventdalen. From the same year, Braathens SAFE started serving the tundra airport with irregular winter flights. In 1957, a principal was hired at the primary school and a new church was opened on 24 August 1958. From 1961, the primary school was supplemented by a private middle school. A branch of Tromsø Sparebank opened in 1959. In the 1960s, the town's farm was closed and replaced by industrial liquifying of powdered milk. The first serial-produced snowmobile was taken into use in 1961. By 1969, there were 140 registered snowmobiles and only 33 registered cars. From 1962 to 1984, a recreational centre was run at Sverdrupbyen. Ordinary operation in Mine 4 started in 1966 but was terminated by 1970, two years after Mine 2b closed. Operations in Mine 6 commenced in 1969. Television broadcasting equipment was installed in 1969, with the schedule of the Norwegian Broadcasting Corporation being aired with a two-week delay. In 1971, a new school building, with a combined primary and lower secondary school, was opened, along with a new gymnasium and a 12.5-meter (41 ft) swimming pool. The Svalbard Council was established on 1 November 1971. It consisted of 17 non-partisan members that were elected or appointed in three different groups—SNSK employees, government employees and others, although the ratio changed several times. Operations of Mine 3 started in March 1971 and operations in Mine 7 commenced the following year. In 1973, the Ministry of Trade and Industry bought a third of SNSK. It continued buying additional shares until reaching a 99.94 percent ownership in 1976. The airport was opened in 1975 and initially provided four weekly services to mainland Norway and semi-weekly services to Russia. In 1978, the community received satellite communications with the mainland. The same year, an upper secondary program was introduced at the public school. From 1984, television programmes were broadcast live via satellite. Store Norske underwent a gradual change during the 1980s. Since 1980, Spitsbergen money has been taken out of circulation and replaced with ordinary Norwegian currency. Mine 6 closed the following year. From 1982, SNSK permitted private individuals to own and operate cars. By 1990, there were 353 registered cars and 883 snowscooters. On 1 July 1983, SNSK moved its head office from Bergen to Longyearbyen. Svalbard Samfunnsdrift (SSD), a limited company that was responsible for public infrastructure and services, was established by SNSK on 1 January 1989. Responsibilities included healthcare, the fire brigade, the kindergarten, roads, rubbish disposal, power production, the water and sewer system, the cinema, cultural actives and the library. Ownership was taken over by the Ministry of Trade and Industry on 1 January 1993. During the 1990s, the authorities started a process to "normalise" Longyearbyen by abolishing the company town scheme and introducing a full range of services, a varied economy and local democracy. Commercial enterprises included a shopping mall replacing SNSK's provision store in 1992. Similarly, Esso opened a commercial fuel station in 1994. The Svalbard Council changed its regulations from 1993 and allowed parties to run for election. In a step to increase tourism, Svalbard Polar Hotel opened in 1995, and a year later mining of Mine 3 terminated. Longyearbyen Community Council was established in 2002, replacing the Svalbard Council and assimilating SSD, and took on many of the responsibilities and the structure of a municipality. This period also saw the rise of a number of scientific establishments. The Agricultural University of Norway had established a primitive seed bank in 1984. The University Centre in Svalbard opened on 6 September 1993 and had 30 students in its inaugural semester. Telenor Mobil established GSM coverage in 1995, and in 2004 the Svalbard Undersea Cable System opened, providing fiber optic cable connection to the mainland. The European Incoherent Scatter Scientific Association (EISCAT) opened a radar in 1996, followed by Svalbard Satellite Station in 1999 and the Svalbard Global Seed Vault in 2008. View of the central parts of Longyearbyen from Platåberget. The body of water is Adventfjorden while the valley up to the right is Adventdalen. 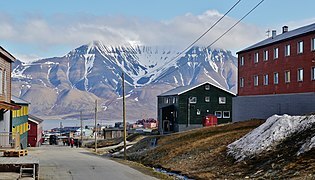 Longyearbyen, the largest settlement in Svalbard, is located in the lower portion of the Longyear Valley, along the Longyear River. The lower parts of the town lie along the southwestern shore of the bay of Adventfjorden, a 7-by-4-kilometer (4 1⁄2 by 2 1⁄2 mi) branch of Isfjorden. Longyearbyen is on the Nordenskiöld Land peninsula of Spitsbergen, the largest island of the Svalbard archipelago. It is the world's northern-most town, with all settlements further north being research or meteorological outposts. Across the bay lie the ghost towns of Advent City and Hiorthhamn. Longyearbyen is divided into several neighbourhoods. On the west side of the river, along the bay, lies the port and affiliated utility and industrial services. The western part of this area is called Bykaia and the eastern part Sjøområdet. Above lies Skjæringa, the site of the Governor's offices. Slightly up the valley on the west side lies Gamle Longyearbyen ("Old Longyearbyen") and the church. Even further up lies the graveyard, then Huset and the cinema, and finally Sverdrupbyen. Most of the residential, commercial and cultural institutions are located on the east side of the river. Along the bay the area is called Sjøskrenten. Further up lies the university centre and Gruvedalen, the largest residential area. Southwards from there is the main shopping area as well as the town hall. To the east is the residential area Lia and further up Haugen, which is also the location of the school. Furthest up in the valley is Mine 2b and Nybyen, which is mostly used as student housing. Westwards out of town towards Hotellneset is the airport and Mine 3. The remaining mines are located in Adventdalen, to the east of town. Svalbard's climate is a combination of an Arctic climate (Köppen: ET) tempered by the North Atlantic Current. Nordenskiöld Land is the warmest and wettest part of the archipelago, caused by the convergence of mild and humid air from the south and cold air from the north. Average summer highs are typically 3 to 7 °C (37 to 45 °F) while average winter highs are −11 to −13 °C (12 to 9 °F). Longyearbyen experiences midnight sun from 19 April to 23 August (127 days), polar night from 27 October to 14 February (121 days) and civil polar night from 14 November to 29 January. However, due to shading from mountains, the sun is not visible in Longyearbyen until around 8 March. Snow typically covers the town from November to March. 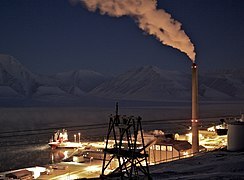 The warmest temperature ever recorded in Longyearbyen was 21.3 °C (70.3 °F) in July 1979 and the coldest was −46.3 °C (−51.3 °F) in March 1986. Svalbard and Longyearbyen are among the places in the world that have warmed fastest in the latest decades. The average temperatures in the table below are based on 1961–90. In the more recent period 1981–2010, winter has warmed 3.4 °C (6.1 °F) and summer 1 °C (1.8 °F) compared to 1961–90. As of 2015, Longyearbyen had a population of 2,144 people. The largest regional group of Norwegians are from Northern Norway, particularly Nordland and Troms, who make up more than 40 percent of the population. Roughly 300 people (16 percent) are non-Norwegian citizens, with the largest nationalities being from Thailand, Sweden, Russia and Ukraine. Because of the dominance of the mining industry, the gender distribution is skewed with 60 percent of adults being males. 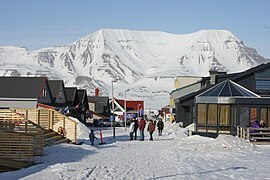 Longyearbyen has an over-average share of its population between 25 and 44 years old, but nearly no residents over 66. The number of children in relation to the population is at the national average, but Longyearbyen has significantly fewer teenagers than the national average. As of 2014 Thai people, numbering 120, were the second largest group of residents after Norwegians; there were 60 in 2006. Thais first came to Svalbard when men brought their wives from Thailand during the 1970s. An RT (Russia Today) article stated that a Thai émigré named Sompong Haug, who married a man and arrived in Svalbard in the 1980s, was "the founder of the Thai community" in Longyearbyen and "the unofficial president of the burgeoning Thai community." In 2006, most of the Thai residents worked as cleaners, and as of 2011 most stay for terms of two to three years to save funds. In 2007, 10 students at the Longyearbyen School were Thai. The Thai community holds festivals each November, and the community has a Thai restaurant and a Thai supermarket. Longyearbyen experiences a very high turnover; in 2008, 427 people (23 percent) moved away from the town. The average person lived in Longyearbyen for 6.3 years, although it is 6.6 years for Norwegians and 4.3 years for foreigners. In 2009, about a quarter of the population had lived in the town since before 2000, and can thus be regarded as its permanent population. The longest-residing people tend to work in the mining industry, followed by local government employees. The shortest tenures are held by students and employees in higher education, tourism and the state. Seventy percent of households consist of a single person, compared to forty-one percent on the mainland, giving an average 1.6 people per household. The difference is largely caused by persons working on Svalbard while their family remains on the mainland. Longyearbyen's population is more highly educated than the national average: 54 percent compared to 43 percent have upper secondary education and 30 percent compared to 26 percent have tertiary education. Among women, 40 percent have higher education. Longyearbyen Community Council has many of the same responsibilities of a municipality. It is organised with a 15-member council that since 2011 has been led by Mayor Christin Kristoffersen of the Labour Party. The council's main responsibilities are infrastructure and utilities, including power, land-use and community planning, education from kindergarten to upper secondary level and child welfare. It operates three kindergartens in addition to the 13-grade Longyearbyen School. No care or nursing services and welfare payments are available. Norwegian residents retain pension and medical rights through their mainland municipalities. The University Hospital of North Norway operates a clinic, Longyearbyen Hospital. Other public offices with presence on Longyearbyen are the Norwegian Directorate of Mining, the Norwegian Polar Institute, the Norwegian Tax Administration and the Church of Norway. Longyearbyen is subordinate Nord-Troms District Court and Hålogaland Court of Appeal, both located in Tromsø. The Svalbard Treaty of 1920 established full Norwegian sovereignty over the archipelago. The treaty came into effect in 1925, following the Svalbard Act that established the institution of the Governor of Svalbard. The governor holds the responsibility as both county governor and chief of police, as well as holding other authority granted from the executive branch. Duties include environmental policy, family law, law enforcement, search and rescue, tourism management, information services, contact with foreign settlements and judge in some areas of maritime inquiries and judicial examinations—albeit never in the same cases as acting as police. Kjerstin Askholt has been governor since 2015; she is assisted by a staff of 26 professionals. The institution is subordinate to the Ministry of Justice and the Police, but reports to other ministries in matters within their portfolio. Because of the special treaty status of Svalbard, Longyearbyen is subject to Norwegian legislation, but citizens of any signatory country may conduct commercial activities and live in town. However, people without a source of income can be rejected by the governor. The treaty limits Norway's right to collect taxes to that of financing services on Svalbard. Therefore, Longyearbyen has a lower income tax than mainland Norway, and there is no value added tax. The treaty has resulted in Longyearbyen being a demilitarized zone and is not part of the European Economic Area nor the Schengen Area like the rest of Norway. Because of the town’s remoteness, there are laws in place that are found in few, if any, other places in the world. Notable examples of such laws include a ban on cats, a restriction on how much alcohol an individual can purchase on a monthly basis, and a requirement that any individuals venturing outside carry a rifle for protection against polar bears. A popular claim made about the town is that it is illegal to die there but the wording in such a claim is misleading. While it is not actually illegal to die in Longyearbyen, there are no options for burial there and residents considered terminal are typically flown to Oslo to live out the remainder of their days. The decision to disallow burials came in 1950, when it was discovered that the bodies of residents who had died as a result of the 1918 flu pandemic had not begun to decompose. Today, scientists fear that the corpses, having been preserved by the permafrost in which they were buried, may still contain live strains of that same virus that killed 5% of the world's population in the 20th century. The community council runs a number of cultural activities, such as a cinema, a youth club, a library and a gallery. The town's sports club is Svalbard Turn. Svalbardhallen is an indoor sport centre that includes a multi-sport hall large enough for handball or three badminton courts, a shooting range and a 25-meter (82 ft) swimming pool. Svalbard Church of the Church of Norway has the entire archipelago as its parish. The congregational hall is 126 m2 (1,360 sq ft) while the sitting room is 112 m2 (1,210 sq ft). The church is built in half-timber. Svalbardposten is a weekly newspaper published on Friday. Printing takes place in Tromsø and the majority of subscribers live on the mainland. Icepeople, an alternative newspaper in English, is also published weekly. There are two museums in town, Svalbard Museum and the Spitsbergen Airship Museum. Dark Season Blues has been held annually in October since 2003. 20 residents of the town are members of the Liverbirds Svalbard and regularly meet in the Svalbar on match days during the winter months. 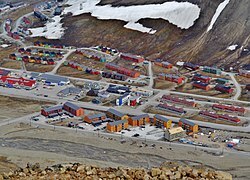 The only mining still taking place in Longyearbyen is at Mine 7, located 15 kilometers (9 mi) up Adventdalen. It produces 70,000 tonnes (69,000 long tons; 77,000 short tons) of coal annually, of which 25,000 tonnes (25,000 long tons; 28,000 short tons) is used to fuel Longyear Power Station, Norway's only coal-fueled power station. Most of Store Norske's production is done at Sveagruva, located on Van Mijenfjorden, 60 kilometers (37 mi) south of Longyearbyen. No roads connect the communities; instead, workers live in dormitories in Svea. Seventy percent commute home to the mainland while thirty percent commute to Longyearbyen. Mining has not been profitable and Store Norske relies on state subsidies to retain production. The University Centre in Svalbard (UNIS) has 350 students and a permanent faculty of 40 professors and assistants and 120 guest lecturers. UNIS does not offer degrees, but instead offers semester courses in biology, physics and geology. Student housing is located at Nybyen. The college is part of the 12,000 m2 (130,000 sq ft) Svalbard Science Centre, which also features the Norwegian Polar Institute, EISCAT and Svalbard Science Forum. In 2006, about 9,000 research days were spent in Longyearbyen, most of which were by Norwegians. This made Longyearbyen the second-largest research outpost on Svalbard, marginally below Ny-Ålesund. In contrast, Longyearbyen has almost only Norwegian research, while Ny-Ålesund is roughly evenly split between Norwegian and foreign. Svalbard Satellite Station was built because of Longyearbyen's excellent location to download data from satellites in polar orbit. Located at Platåberget above Hotellneset, it was built as a cooperation between NASA and the Norwegian Space Centre, but has since 2001 been operated by Kongsberg Satellite Services. EISCAT operates an incoherent scatter radar to study the northern lights. The Svalbard Global Seed Vault, administered by the Global Crop Diversity Trust, is a secure underground facility capable of storing millions of crop seeds. The facility has been designed to protect against natural and human disasters, including global warming, floods and fires and nuclear holocaust. The site was chosen for a number of factors including its remoteness, sound geology and the ambient temperature of the permafrost. Longyearbyen is the centre of tourism on the archipelago, although most tourism is generated based on natural experiences rather than visiting the town itself. However, Longyearbyen does provide supplies, accommodation and several museums. In 2008, Longyearbyen experienced 89,000 guest-nights, up from 30,000 in 1995. The average guest stayed 2.2 nights and 60 percent of the capacity was used by tourists. About 40,000 tourists flew into Longyearbyen. Two-thirds of the tourists come from Norway. In 2007, the tourism industry had a revenue of NOK 291 million and produced 200 man-years. Longyearbyen School serves ages 6-18. It is the primary and secondary school in the northernmost location on Earth. Once pupils reach ages 16 or 17 most families move to mainland Norway. There is a non-degree offering tertiary educational institution in Longyearbyen, University Centre in Svalbard (UNIS), the tertiary school in the northernmost location on Earth, co-located with the Norwegian Polar Institute, the Svalbard Museum, and the Svalbard Science Forum. Longyearbyen has a road network stretching 50 kilometers (30 mi), but the network does not extend to any other communities. In 2008 there were 1,481 registered road vehicles and 49 percent of all households had a car. Cars are registered with ZN on the registration plates. There is a single workshop, Svalbard Auto, which is also a Toyota dealer. Snowmobiles are a popular mode of transport and there are more snowmobiles than residents. In 2008 there were registered 2,672 snowmobiles and 69 percent of households owned at least one. Off-road motorized transport is prohibited on bare ground, but snowmobiles are used extensively during winter—both for commercial and recreational activities. 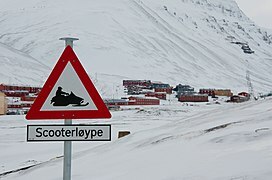 Transport from Longyearbyen to Barentsburg (45 km or 28 mi) and Pyramiden (100 km or 62 mi) is possible by snowmobile by winter, or by ship all year round. Svalbard Airport, Longyear is located at Hotellneset, 3 kilometers (1.9 mi) northwest of town. It has a 2,483-meter (8,146 ft) long runway and is the only airport that is permitted to serve aircraft from off the archipelago. Scandinavian Airlines operates daily flights to Oslo and Tromsø, while there are irregular flights to Russia. Lufttransport operates regular charter services to Svea Airport and Ny-Ålesund Airport, Hamnerabben. Arktikugol operates helicopters to Barentsburg and Pyramiden. There are two quays in Longyearbyen, one for export of coal and one for general goods. From 1907 to 1987, the mining companies operated a network of aerial tramways to transport coal from the mines to the port. In the years 1907/1908 the then worldwide leading German wire ropeways company Adolf Bleichert & Co. from Lipsia built a material cableway from mine 1 to the ship's loading station, which was later supplemented by a cableway to mine 2. The remains of these wire ropeways and later successors to other mines are still visible today. ^ a b "Longyearbyen". Norwegian Polar Institute. Archived from the original on 15 March 2012. Retrieved 15 March 2012. ^ Bartlett, Duncan (12 July 2008). "Why dying is forbidden in the Arctic". BBC News. Archived from the original on 13 March 2012. Retrieved 13 March 2012. ^ a b c d "9 Næringsvirksomhet". St.meld. nr. 22 (2008–2009): Svalbard. Norwegian Ministry of Justice and the Police. 17 April 2009. Retrieved 24 March 2010. ^ "Industrial, mining and commercial activities". Report No. 9 to the Storting (1999–2000): Svalbard. Norwegian Ministry of Justice and the Police. 29 October 1999. Archived from the original on 19 April 2012. Retrieved 19 April 2012. ^ a b "Adventfjorden". Norwegian Polar Institute. Archived from the original on 19 March 2012. Retrieved 19 March 2012. ^ Rosenthal, Elisabeth (3 March 2008). "A Speck of Sunlight Is a Town's Yearly Alarm Clock". The New York Times. Archived from the original on 15 March 2012. Retrieved 15 March 2012. ^ "Advent City". Norwegian Polar Institute. Archived from the original on 19 March 2012. Retrieved 19 March 2012. ^ "Longyearbyen map" (PDF). Svalbard Reiseliv. Archived (PDF) from the original on 19 March 2012. Retrieved 19 March 2012. ^ "Climate and daylight in Svalbard (Longyearbyen)". NordicVisitor. Archived from the original on 15 March 2012. Retrieved 15 March 2012. ^ "Sunrise and sunset times for Longyearbyen". Suncurves. Retrieved 28 April 2014. ^ "Climate and daylight in Svalbard (Longyearbyen)". NordicVisitor. Retrieved 18 May 2011. ^ Sjöblom, Anna. "Weather Conditions on Svalbard" (PDF). Retrieved 13 June 2015. ^ "Longyearbyen (Svalbard), Sogn og Fjordane Weather Averages". World Weather Online. Retrieved 12 December 2016. ^ a b c "Om Longyearbyen" (in Norwegian). Longyearbyen Community Council. 26 March 2009. Archived from the original on 14 March 2012. Retrieved 14 March 2012. ^ a b c d "Pendlere eller fastboende?" (PDF) (in Norwegian). Statistics Norway. 26 March 2009. Archived (PDF) from the original on 17 March 2012. Retrieved 17 March 2012. ^ a b "Ah The Thai chef". Norwegian Air Shuttle (inflight magazine). Retrieved 29 October 2017. ^ a b "Immigrants warmly welcomed". Al Jazeera. 4 July 2006. Retrieved 29 October 2017. ^ a b "Norwegian wok: Thai community thrives on ice-cold Spitsbergen". RT. 14 October 2011. Retrieved 29 October 2017. ^ "Learning in the freezer". The Guardian. 29 August 2007. Retrieved 29 October 2017. ^ Amundsen, Birger (10 October 2011). "Kvinne valgt av folket". Svalbardposten (in Norwegian). Archived from the original on 16 March 2012. Retrieved 16 March 2012. ^ "Information for foreign citizens living in Longyearbyen". Governor of Svalbard. 15 August 2011. Archived from the original (PDF) on 14 March 2012. Retrieved 14 March 2012. ^ a b "The administration of Svalbard". Report No. 9 to the Storting (1999–2000): Svalbard. Norwegian Ministry of Justice and the Police. 29 October 1999. Archived from the original on 19 April 2012. Retrieved 19 April 2012. ^ "Dagens sysselmann på Svalbard" (in Norwegian). Governor of Svalbard. Retrieved 25 February 2016. ^ a b "Svalbard Treaty". Wikisource. 9 February 1920. Retrieved 24 March 2010. ^ "Entry and residence". Governor of Svalbard. Archived from the original on 23 July 2011. Retrieved 24 March 2010. ^ "Alcohol and tobacco". Governor. Retrieved 23 February 2018. ^ "12 Facts You Never Knew About Longyearbyen: The World's Northernmost City -". www.johnnyjet.com. Retrieved 23 February 2018. ^ "Inside Longyearbyen, the Arctic town where dying is ILLEGAL because corpses don't decompose". The Sun. 12 February 2018. Retrieved 23 February 2018. ^ "Development of the local community in Longyearbyen". Report No. 9 to the Storting (1999–2000): Svalbard. Norwegian Ministry of Justice and the Police. 29 October 1999. Archived from the original on 19 April 2012. Retrieved 19 April 2012. ^ "Information about the museum". Spitsbergen Museum. Archived from the original on 19 March 2012. Retrieved 19 March 2012. ^ "Spitsbergen Airship Museum". Spitsbergen Airship Museum. Archived from the original on 19 March 2012. Retrieved 19 March 2012. ^ Langset, Mona (22 October 2009). "Svalbard-blues skal lyse opp i mørketiden". Verdens Gang (in Norwegian). Archived from the original on 11 April 2012. Retrieved 11 April 2012. ^ "Gruve 7". Store Norske Spitsbergen Kulkompani. Archived from the original on 15 March 2012. Retrieved 15 March 2012. ^ "Svea Nord". Store Norske Spitsbergen Kulkompani. Archived from the original on 15 March 2012. Retrieved 15 March 2012. ^ "Sveagruva". Norwegian Polar Institute. Archived from the original on 15 March 2012. Retrieved 15 March 2012. ^ "Gruvedrift: Svalbardsamfunnets hjerte" (PDF) (in Norwegian). Statistics Norway. October 2009. Archived (PDF) from the original on 17 March 2012. Retrieved 7 March 2012. ^ "Arctic science for global challenges". University Centre in Svalbard. Archived from the original on 14 March 2012. Retrieved 14 March 2012. ^ "Pendlere eller fastboende?" (PDF) (in Norwegian). Statistics Norway. October 2009. Archived (PDF) from the original on 19 March 2012. Retrieved 17 March 2012. ^ Grønli, Kristin Straumsheim (December 2006). "Øyet i himmelen laster ned på Svalbard". Forskning.no (in Norwegian). Archived from the original on 14 March 2012. Retrieved 14 March 2012. ^ Roug, Louise (12 October 2007). "The Seed Bank Atop the World". Los Angeles Times. Archived from the original on 15 March 2012. Retrieved 15 March 2012. ^ "Turisme: Stadig flere vil oppleve Arktis" (PDF) (in Norwegian). Statistics Norway. October 2009. Archived (PDF) from the original on 19 March 2012. Retrieved 19 March 2012. ^ "Heidi The glaciologist". Norwegian Air Shuttle (inflight magazine). Retrieved 29 October 2017. ^ a b c "Lov og rett: Anerledes lov og orden" (PDF) (in Norwegian). Statistics Norway. October 2009. Archived (PDF) from the original on 19 March 2012. Retrieved 19 March 2012. ^ "Om oss" (in Norwegian). Svalbard Auto. Archived from the original on 13 March 2012. Retrieved 13 March 2012. ^ "Airport information for ENSB" (PDF). Avinor. Archived from the original (PDF) on 11 June 2012. Retrieved 20 April 2012. ^ a b "11 Sjø og luft – transport, sikkerhet, redning og beredskap". St.meld. nr. 22 (2008–2009): Svalbard. Norwegian Ministry of Justice and the Police. 17 April 2009. Archived from the original on 15 March 2012. Retrieved 15 March 2012. ^ Avinor. "Destinations from Svalbard Airport, Longyear" (in Norwegian). Archived from the original on 15 March 2012. Retrieved 15 March 2012. Agriculture in Svalbard – the world's northernmost – has a short history, and remains a minor economic factor, but has nonetheless had a culturally and socially significant role, as well as an ecologic impact. Svalbard is also home to the Global Seed Vault, which serves to protect the world's biological and agricultural diversity. Polar Permaculture Solutions, AS was formed in January 2015. Polar Permaculture has been focused on producing locally grown food in town, and also with composting food waste. The Governor of Svalbard (Norwegian: Sysselmannen på Svalbard) represents the Norwegian government in exercising its sovereignty over the Svalbard archipelago (Spitsbergen). The position reports to the Norwegian Ministry of Justice, but it maintains all Norwegian interests in the area, including environmental protection, law enforcement, representation, mediation, and civil matters, such as marriage, divorce. An important part of the position is to maintain good working relations with the Russian community in Barentsburg. a staff section with Russian interpreters and advisors on legal matters, tourism, etc. an administrative section, including archiving, financial management and IT supportThe governor's office also has at its disposition several helicopters, snowscooters, speedboats and other equipment needed to meet its responsibilities. The office's annual budget is determined by the Norwegian Storting, and runs at about NOK 60 million, of which the largest part is used for transportation. Longyearbyen Community Council (Norwegian: Longyearbyen lokalstyre) is the local government for Longyearbyen in Svalbard, Norway. It has many of the same responsibilities of a municipality. It is organized with a 15-member council which since 2011 has been led by Mayor Christin Kristoffersen of the Labour Party. The council's main responsibilities are infrastructure and utilities, including power, land-use and community planning, education from kindergarten to upper secondary level and child welfare. It operates three kindergartens in addition to the 13-grade Longyearbyen School.The Svalbard Council was established on 1 November 1971. It consisted of 17 non-partisan members which were elected or appointed in three different groups—SNSK employees, government employees and others, although the ratio changed several times. Svalbard Samfunnsdrift (SSD), a limited company which was responsible for public infrastructure and services, was established by SNSK on 1 January 1989. Responsibilities included healthcare, the fire department, the kindergarten, roads, garbage disposal, power production, the water and sewer system, the cinema, cultural actives and the library. Ownership was taken over by the Ministry of Trade and Industry on 1 January 1993. During the 1990s, the authorities started a process to "normalize" Longyearbyen by abolishing the company town scheme and introducing a full range of services, a varied economy and local democracy. The Svalbard Council changed its regulations from 1993 and allowed parties to run for election. Longyearbyen Community Council was established in 2002, replacing the Svalbard Council and assimilating SSD. Ny-Ålesund Airport, Hamnerabben (Norwegian: Ny-Ålesund flyplass, Hamnerabben; ICAO: ENAS) is an airport serving the research community of Ny-Ålesund in Svalbard, Norway. The airport is owned by Kings Bay, who also owns the company town. The only flights available are to Svalbard Airport, Longyear, operated two to four times a week by Lufttransport using Dornier Do 228 aircraft. The services are organized as corporate charters and tickets are only available after permission from Kings Bay. Between 1925 and 1928, Ny-Ålesund saw four air expeditions to the North Pole, two of which required the construction of an airship hangar and mast. The first proposal for an airport in Ny-Ålesund was launched in 1956 by Norsk Polar Navigasjon, who proposed an airport at Kvadehuksletta. Soviet protests against the airport caused the Norwegian authorities to oppose the plans, which were laid to rest in the early 1960s. Construction at Hamnerabben started in 1965 following the decision to build Kongsfjord Telemetry Station. 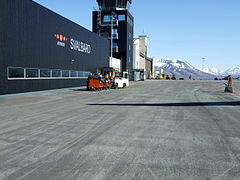 The airport first hosted service to temporary landing strips near Longyearbyen, but from 1975 served Svalbard Airport. Lufttransport started flights with helicopters in the 1980s, but from 1989 has flown with fixed-wing aircraft. Public administration of the archipelago is the responsibility of the Governor of Svalbard, who acts as county governor and chief of police. The institution was established by and is regulated by the Svalbard Act, which also limits which Norwegian laws apply to the islands. Longyearbyen Community Council is the only elected local government and is organized similar to a mainland municipality. Other Norwegian government agencies with a presence are the Directorate of Mining and the Tax Administration. The only diplomatic mission is the Consulate of Russia in Barentsburg. The archipelago was spotted in 1596, and soon companies from England, the Netherlands, Denmark–Norway and France were whaling and hunting. Both England and Denmark–Norway claimed the land, while the Dutch and France claimed the mare liberum principle, resulting in Svalbard becoming terra nullius—land without sovereignty. Work on establishing a public administration started in the 1870s, but did not progress until the 1900s, when the establishment of coal mining communities created a more urgent need. The Svalbard Treaty was signed following the Paris Peace Conference in 1920, and the governor and act came into effect in 1925. By then only Norwegian and Russian communities remained. After the Second World War and the outbreak of the Cold War, Svalbard became polarized with Norwegian and Soviet communities isolated from each other. Norway carried out a more defensive foreign policy on Svalbard compared to on the mainland, and foreign activity was held at a minimum. The Soviet Union issued protests against virtually all new Norwegian activity. At the time there were twice as many Soviet citizens as Norwegians on the islands. More than half the archipelago was conserved in 1973. Since the 1990s Longyearbyen has become "normalized", abandoned the company town structure and seen its population doubled. On the other hand, the Soviet communities have dwindled, with only a few hundred residents remaining in Barentsburg. Svalbard Airport, Longyear (IATA: LYR, ICAO: ENSB; Norwegian: Svalbard lufthavn, Longyear) is the main airport serving Svalbard in Norway. It is located 1.6 nautical miles (3 km) northwest of Longyearbyen, and is the northernmost airport in the world with scheduled public flights. The first airport near Longyearbyen was constructed during World War II. In 1959, it was first used for occasional flights, but could only be used a few months a year. Construction of the new airport at Hotellneset started in 1973, and the airport was opened on 2 September 1975. It is owned and operated by state-owned Avinor. In 2014, the airport handled 154,261 passengers. Scandinavian Airlines operates daily flights to Tromsø and Oslo in mainland Norway. Lufttransport provides services to the two other airports on Svalbard: Ny-Ålesund and Svea, using Dornier Do 228 turboprop aircraft. There are also regular charter flights. Svalbard Radio is a coast radio station established in 1911 at Finneset in Svalbard, Norway. In 1930, it moved to Skjæringa in Longyearbyen and since 1975 it has been co-located with Svalbard Airport, Longyear. It has been remote-controlled from Bodø Radio since 2006. Svalbard Satellite Station (Norwegian: Svalbard satelittstasjon) or SvalSat is a satellite ground station located on Platåberget near Longyearbyen in Svalbard, Norway. Opened in 1997, it is operated by Kongsberg Satellite Services (KSAT), a joint venture between Kongsberg Defence & Aerospace and the Norwegian Space Centre (NSC). SvalSat and KSAT's Troll Satellite Station (TrollSat) in Antarctica are the only ground stations that can see a low altitude polar orbiting satellite (e.g., in sun-synchronous orbit) on every revolution as the earth rotates. The facility consists of 31 multi-mission and customer-dedicated antennas which operate in the C, L, S and X bands. The station provides ground services to more satellites than any other facility in the world. Customers with their own installations include the European Organisation for the Exploitation of Meteorological Satellites (EUMETSAT), the National Aeronautics and Space Administration (NASA), the European Space Agency (ESA) and the National Oceanic and Atmospheric Administration (NOAA). The station also reads and distributes data from the Japanese Hinode solar research satellite. The facility has seen a large increase in smaller customers after 2004, when the Svalbard Undersea Cable System started providing a fiber Internet connection. Concessions for downloading are only issued to civilian satellites, yet some data has been indirectly used by armed forces. There is a disagreement as to whether this constitutes a breach of the Svalbard Treaty. Svea Airport (Norwegian: Svea flyplass; ICAO: ENSA) is a private airport located in and serving the Sveagruva (also known as Svea) in Svalbard, Norway. The airport is owned and operated by Store Norske Spitsbergen Kulkompani, who use the airport to transport their coal mining workers from the company town to Longyearbyen and Svalbard Airport, Longyear. The airport features a gravel runway measuring 800 by 30 meters (2,625 by 98 ft). Flights are operated about thirty times per week by Lufttransport using their two Dornier Do 228s. Sveagruva (meaning Swedish Mine), or simply Svea, is a mining settlement in the Norwegian archipelago of Svalbard, lying at the head of Van Mijenfjord. It is the third largest settlement in the archipelago (after Longyearbyen and Barentsburg). Currently, around 300 workers living in Longyearbyen commute to Sveagruva for work on a daily or weekly basis. Sveagruva has no permanent inhabitants. The mine is operated by Store Norske Spitsbergen Kulkompani and is served by Svea Airport. Uniquely, the Norwegian archipelago of Svalbard is an entirely visa-free zone. Everybody may live and work in Svalbard indefinitely regardless of country of citizenship. The Svalbard Treaty grants treaty nationals equal right of abode as Norwegian nationals. Non-treaty nationals may live and work indefinitely visa-free as well. Per Sefland, then Governor of Svalbard, said "It has been a chosen policy so far that we haven't made any difference between the treaty citizens and those from outside the treaty". "Regulations concerning rejection and expulsion from Svalbard" are in force on a non-discriminatory basis. Grounds for exclusion include lack of means of support, and violation of laws or regulations.Hans-Henrik Hartmann, then head of the legal unit at the Norwegian government's immigration department, said, "If an asylum seeker is refused residence in Norway he can settle in Svalbard so long as he can get there and is able to pay for himself." "In the past, immigrants who have been refused a visa for mainland Norway have moved to Longyearbyen, lived there for seven years and been awarded Norwegian citizenship." Svalbard has a high living cost. Sending refugees to Svalbard has been suggested. The open-border policy of Svalbard has been referred to as a reason to consider Svalbard as a refugee settlement.